When you are tasked with making deviled eggs for a summer party....but deviled eggs aren't really your thing...do something fun instead. These baked eggs are a nice change of pace from the classic deviled eggs you'll find at most picnics. They taste delicious, are fun to eat and have a tangy yogurt filling that you won't be able to resist. I'll admit that making these eggs is even more fun with cool tools like the Le Creuset egg dish, the KitchenIQ measuring spoons and cool cutting boards and of course Stonyfield yogurt. Preheat the oven to 350 degrees. Butter your Le Crueset egg dish. Whisk eggs with salt & pepper in a large measuring cup. Gently pour into prepared egg dish and bake for 15 mins. Remove from the oven, pop eggs from dish and allow to cool on a cooling rack. In the meantime mix together yogurt, garlic powder and salt and pepper. Add the mixture to a piping bag. When the eggs are cool enough to handle you can remove a small amount out of the center of each with a little spoon. Pipe the yogurt filling into the center and top with a sprinkle of paprika. Your "printable recipe" tab is not working. I tried to click on it with no success. I would love to print egg bites recipe. Thank you. I saw these earlier on social media and began to salivate immediately. Needles to say they went straight to the top of my "must make" list! We really enjoy eggs any way we can get them. 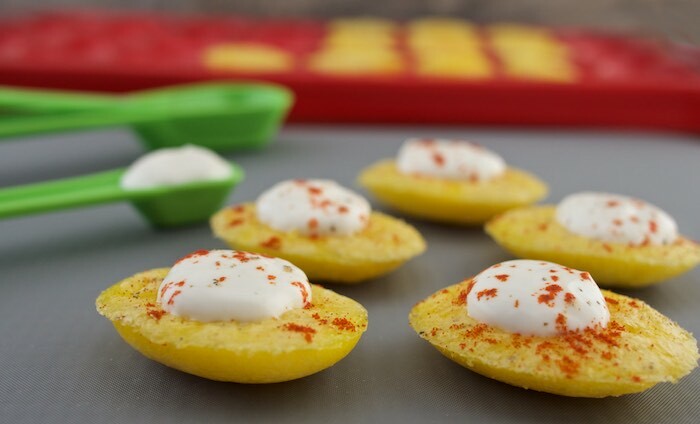 Our kids always would chow down on deviled eggs but this is really a great variation. I'm definitely trying them out. What a unique twist on deviled eggs! I love baking eggs. What an awesome idea for the appetizer. So simple but so good!